I’ll never forget my first special meal on an airplane. 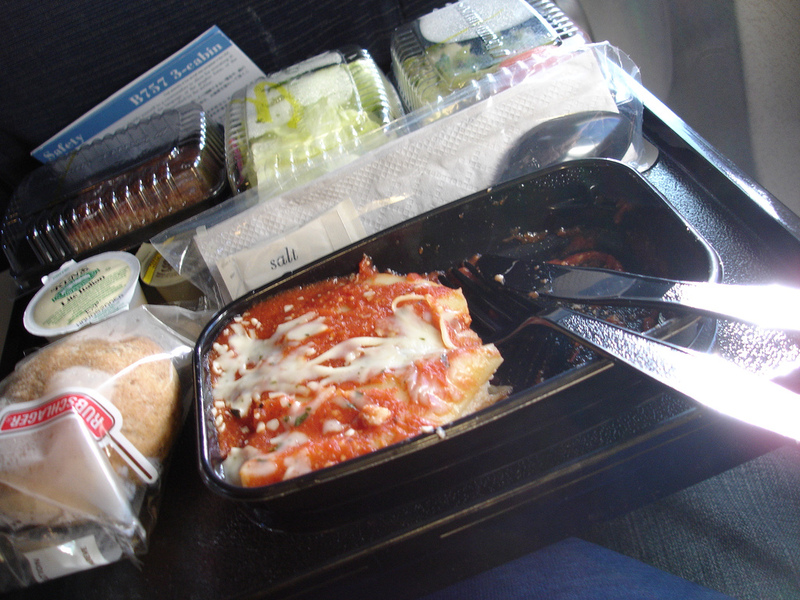 I was 14, and flying with my sister between our parents, and the airline had some sort of new vegetarian option. In a routine that was to become very familiar, we got our meal, stuffed peppers, first, before the regular service, on trays with our names on them. It was exciting because we were so used to there not being food we could eat – at that time our options in restaurants were usually extremely limited, no one knew what to cook for us and not eating meat was just, well, odd. For most people, a meal was not a meal without flesh. That extended to airplanes, where, as we remember from the movie Airplane, at that time the choices were usually meat or fish. Because it was a new service, we were given a comment card to fill in on that flight. We said we enjoyed it, though we told them that we weren’t thrilled that they seemed to think that being vegetarian meant being on a weight loss diet, since we got margarine and fat free dressing and a healthy dessert instead of the butter, dressing and the yummy thing the other people got. We felt that being vegetarian was just not eating meat, it didn’t have any other goal. In fact, it always struck me how this was a big misunderstanding about being vegetarian, and that as vegetarians were often more into health food than others, we were thus more likely to want the dressing made from real ingredients over the unnatural fat free gelly thing. Since that flight, I almost always remembered to pre-order the special meal from among the growing list of choices. The times I did forget, or there was a mistake, or flights got changed or missed, there was always the question if I’d actually be able to eat or be reduced to begging buns from the flight crew. The meals and the procedures never really changed, and they never stopped giving me margarine and a “healthy” dessert. So, for my recent flight to San Diego, I was very surprised to no longer find vegetarian as one of the options when I went to pre-book my meal. There were some special meals, including vegan, Asian vegetarian and gluten free, but not my normal lacto-ovo vegetarian. As I thought about it, I remembered that I had noticed on recent flights that one of the regular options was now usually vegetarian, but this lack of ability to pre-book a meal pointed to the idea that this was now a structural change. So, I decided to test this and risk not ordering one of the other special meals and hope for the best. And, indeed, I got my meal with everyone else. Vegetarian pasta. With butter, regular dressing and a lovely brownie. It’s a bit silly how excited this made me, just to be normal on the plane. But even though the second meal still had meat, and even though United is pretty clueless, this experience still gave me hope. It made me reflect that things do change. One of the meal choices for everyone is now usually meatless. People now don’t think that a meal always has to have meat in it, even if they’re not vegetarian. All of our little actions, all the individual choices to no longer eat meat or to eat less meat, all of these things have made a structural change. If I think about the meat-eating world when I had that first special airplane meal, and look at how different it is now, with vegetarian and vegan choices all over the place, all the way up to airplane meals, I can see that it does work. And, given the structured and standardized world of airplane meals, I think it is a pretty good sign that vegetarianism is now mainstream. It gives me hope that if we actually change what we do, we can see changes happen. It may be slow – this was 30 years in the coming – but it can eventually happen. Now just to do something about the turkey sandwich.